Now you can deter robbery, theft, and vandalism without the high cost of a real security camera. Even the most sophisticated criminals will think the premises are guarded by a high-tech surveillance system and go in search of an easier target. In fact, this is an actual surveillance camera that has been modified into a "dummy" or fake security camera. It has a flashing LED light so it can be noticed at night or day and will stand out to potential thieves or shoplifters and make them think twice. It has an adjustable plastic mounting bracket so it can be wall or ceiling mounted. 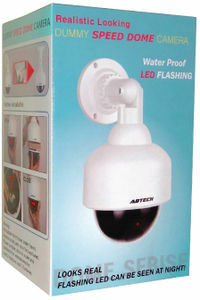 This camera is great security for parking lots or near the front door of a home, store, or business. Installs quickly and easily using the included stainless steel screws. This camera measures 10 three-quarter x 5 inches (the dome measures 4 inches). The flashing light requires 2 AA batteries (not included).